Never in the history of any football club had the presentation of a player been so anticipated. Today, over 80,000 fans gathered at the Bernabeu to greet Ronaldo as a Madridista. A stage was set on the north side of the pitch, with trophies and pictures of legendary Real Madrid players surrounding it. The first to take it were President Florentino Perez, Honorary President Alfredo di Stefano and guest of honour and legendary Portuguese player Eusebio. "Thank you all for being here. You represent the greatest symbol of Madridismo, which is the passion the Club Members and fans all around the world feel for this team. You are essential in making this the most admired and respected club in the world. What's happening tonight has no precedent and your massive attendance represents the essence of this Real Madrid. Thank you for being the stars in this unstoppable showcasing of strength, excitement and vision." "There are Portuguese fans here with us today to help us greet one of their own into this house. It is an honour for us to have here one of the best players of all times and a symbol of the best Portuguese football in history: the legendary Eusebio." "You must all be aware that here, on this stage, we have two friends that happen to be two of the best players in history: Eusebio and Di Stefano. Very few are privileged enough to reach greatness and we are greeting one of those people today. Real Madrid welcomes one of the chosen ones capable of making the dreams of football fans throughout the world come true. Today we welcome Cristiano Ronaldo." At that moment, the player came out from the dressing room amidst cheers of "Si, si, si. Ronaldo en el Madrid." (Yes, yes, yes, Ronaldo at Real Madrid). As soon as Cristiano reached the stage, the President finished off his speech. "Dear cristiano Ronaldo. This is your crowd now. It is the same crowd that put Real Madrid at the height of world football. Your talent has allowed you to see one of your dreams come true. We are very satisfied with knowing you wanted to play for Real Madrid. Football for you is a blessing and you are aware of the fact that the priority here is the success of the team as a whole. Cristiano, welcome to the Santiago Bernabeu Stadium. Welcome to the place where our legend was born. Welcome to Real Madrid." "I am very happy about being here. This is a dream come true; as a child I dreamt of playing for Real Madrid. I didn't expect the stadium to be packed. This is unbelievable. Thank you all. Hala Madrid!" 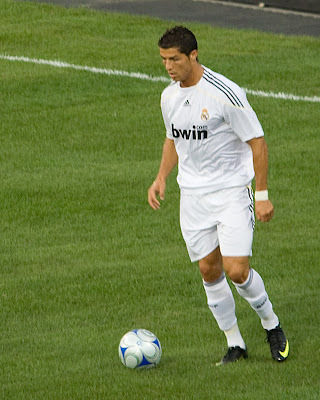 Following these brief words, Ronaldo got close to the stands and greeted many supporters.